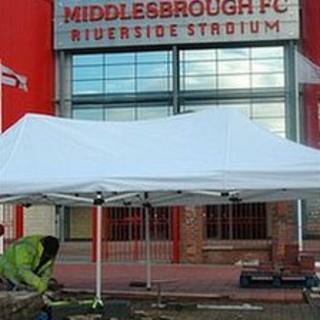 Christmas gifts have helped the latest phase of Middlesbrough FC's "brick road" take shape. The feature outside the Riverside Stadium is made up inscribed bricks dedicated to 60 former stars and managers, and about 7,000 supporters. There was a mid-November deadline for ordering the most recent batch, which were put in place in time for the festive season. Dedicatees include Stewart Downing and local comedian Roy "Chubby" Brown. They lie alongside bricks inscribed to such stars as Brian Clough, Graeme Souness, Gareth Southgate, and eight former Boro players who lost their lives serving their country. Explorer Captain James Cook, who was born in Middlesbrough also has his own brick.